The coffin is 2.25 m in length, 0.49 m in width and 0.28 m in height with the body and lid skillfully done. 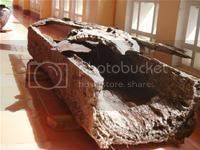 According to experts, burying the dead in tree trunk coffins was a custom of the Malaysian-Polynesian people who used to engage in trade in the Quang Tri area. It was also the tradition of the Mon-Khâ€™me language speaking group, who lived in the area 700 years ago. Were there any remains in the coffin? The article didn’t say, although I highly doubt human remains would survive after 700 years in Southeast Asia – the environment is too humid.